Practice Thermodynamics questions and answers for interviews, campus placements, online tests, aptitude tests, quizzes and competitive exams. This set of Thermodynamics Multiple Choice Questions & Answers (MCQs) focuses on “Useful Work”. Explanation: Useful work = actual work – work performed on the atmosphere. 2. In a steady flow system, which of the following does not change? Explanation: The volume of the system remains constant for a steady flow system. Explanation: In a steady flow system, the volume of the system does not change but it changes for unsteady flow system. Explanation: This term comes very frequent and is considered as availability function. Explanation: The maximum useful work increases in this case. 6. When the system is in equilibrium with the surroundings, this state of the system is known as dead state. Explanation: In this state, the system has pressure and temperature as that of surroundings, there is no chemical reaction mass transfer and has minimum potential energy. Explanation: The maximum useful work will be increased by dQ(1-To/Tr) where dQ is the heat received by the system. Explanation: More the system goes towards surroundings, lesser is the opportunity to produce more work. Explanation: When the system is in equilibrium with the surroundings, its pressure and temperature is Po and To and there should not be any chemical reaction or mass transfer. 10. All spontaneous processes terminate at the dead state. Explanation: At dead state, the system is in equilibrium with the surroundings and hence the opportunity of producing work ceases to exist. 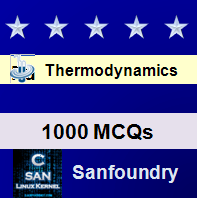 Sanfoundry Global Education & Learning Series – Thermodynamics. To practice all areas of Thermodynamics, here is complete set of 1000+ Multiple Choice Questions and Answers.